touristalk.com is a dynamic and growing alliance of experienced and well trained tour guides, addressing the demand by high tech travelers for innovative but cost efficient trips. We have full time professional who love what they do. Interpreting the country's heritage is their passion. On touristalk.com travelers can look up tour guides and contact them directly. We are committed in changing the relationship between travelers and the Operators.Available to work on your Roam. From travel advise to tourist Guidence , to travel Arrangments , we make it easy to connect and work together to get your Dream Vacation. We believe there is a better way to get vacation done. Tourist should have easy access to Expert Operators all around the India-Nepal-bhutan-Srilanka, select who they wish to tour with, and have dream vacation completed without any surprises. We are equally passionate about providing genuine opportunities for our talented Tour guides to do the vacation they love. Search for Guides At your holiday destination. Ask tour plan directly:To the guide or by participating in the blog, read the guide reviews. Find the ideal guide for a great holiday experience. Make your bookings:Directly with the guide. You have now made an informed decision on one of the most important aspects of your holiday. About your experience Your review is invaluable to future travellers. Earn positive reviews through feedback online translating to more clientele. Tour guides/ Tour companies to create their profiles with distinct features, such as their linkages to tour ativities and ancilliary services provided. Travel service providers can personalise their pages to their hearts content, thereby expressing their personalities better. Do you want to broadcast live footage on the go? Live Stream/videos of your Tours.Embed your broadcasts and videos on any web page & channels. Express yourself better with more image heavy Blog.Managing your pictures is extremely easy!. An intuitive internal email system that will be the nerve centre of communication between travellers and service providers. This will reduce spam; email addresses are no longer required to be displayed on home page.. If you link your account to Facebook and/ or Twitter, we will display the number of �Friends� and �Followers� you have on these social media onto your profile. This will allow travellers to click through to your Facebook and Twitter accounts to find out more about you. Therefore they will place a greater degree of trust on your profile and will be more likely to contact you for your services..
Much more control on your profile. Not happy with the way your profile looks? Unpublish it while you work on it. Taking a year off guiding? Disable your profile and activate it as and when you are ready to get back to business.you can set vacation. touristalk.com now provides widget which you can place on your website. To do so, go to the "My Account " tab, and select "widget". Once there, please follow the instructions on the page.. Manage your customer database in this easy to use CRM. Store, search and group customers. Import from CSV. Keep private notes. Multiple contacts per customer..
Part-time or full-time, Group or in-person, Delhi or Bodhgaya, Heritage or culture - whatever may be your preference . Guide all the tourist or tour group you want for as long as you want without paying a cut of your fees to us. .
We promote your company profile extensively on our website for free, which helps you manage your online brand. Personal Assistance to TravelAgents . Dedicated account manager to assist you in the entire process of converting leads. .
Set Up Fee Guide/Agency can set Multiple way Fee Structure. keep track of all your small business information in one easy to use location. Let customers login to see the status on their jobs and invoices.. Receive payments on invoices via secure PayPal, Google Checkout or Bank transfer. Invoices marked as paid upon successful payment. Part payment on invoices. Payment history. Payment receipt..
Want access to the Tourist Talk on the road? This system comes with a cut down mobile friendly view. Try it from your phone to see! You can also disable the ?mobile view? and use the standard responsive layout if you wish..
A great easy to use Calendar for organising your business. Similar to Google Calendar. Create events, assign Customers and Staff members..
update account and receive ongoing updates. Please go to Settings > Upgrade to see a list of available updates, a list of changed files and version numbers will appear.. Tourist Talk provides special badge to guides that have good reviews, and are rated highly on tourisitguides.in You should ensure that your clients start writing reviews for your services, to qualify for these Badges .They will automatically be available to you once you start receiving good reviews.Apart of that few guides are member of associations as well as award winners we put special badge . 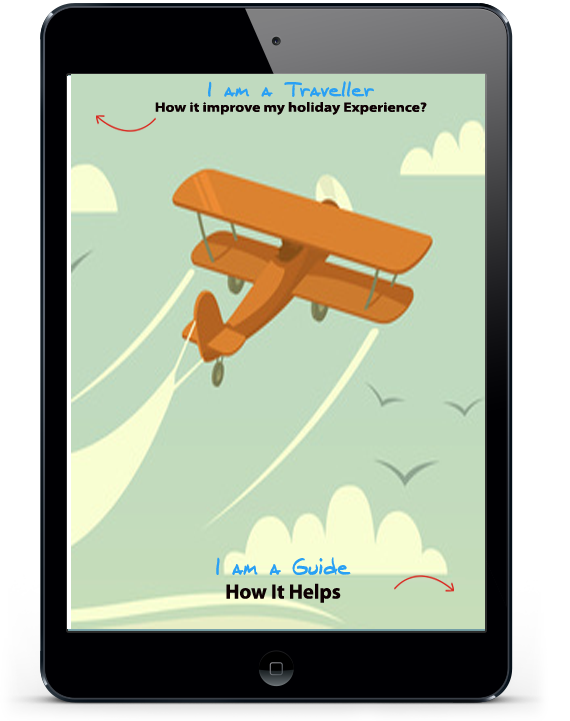 Review is part of tourist it will help guides for better feedback as well as experience review is invaluable to future travellers..
Search for Tour Guides At your holiday destination.. Image friendly tour itineraries that give travellers a better idea of their holiday destination.Loads of features to customize tour offerings such as multi-day tour programs, personalised departure dates and schedules, and logical search options by city or keyword..
Travellers can directly post thier tour plan . Generate PDF invoices, email invoice to customer straight from system. Mark when invoice is paid. Overdue notices. Part payments & invoice merging. .
To get information on the mobile phone as and when required. A Free gift waiting for you when you SignUp . So, now�s the time to get your Lead done.All the Gigs you need also in your pocket.Activate your Account . Yes, Tourist Talk is here in force and this is a key time for any business, no matter how big or small. So whether you need a new newsletter ,new content, new images or new look, Tourist Talk can help. One Time Design for Life Time Business. Make a Professional Looking Website or Tour Activity Landing PagesToday ! Get your website up and running in minutes. It's mobile and search engine friendly too! no matter how big or small. Our Partners can help. .